Whoever said you can’t produce quality work in a short amount of time? The Transdisciplinary Design MFA program surely puts that idea to shame – a project that students worked on for three days made it’s way to an exhibit in Soho! At the start of every fall semester, the TransDesign program has a weeklong “intensive” in which students are broken out into teams and given a prompt for which they have to deliver a final project by the end of the week. Part orientation, part bootcamp, it’s an excellent format for breaking the ice and kicking off the semester with gusto. For Fall 2015, the topic was food systems. Each group was given two attributes to consider, be it waste, energy, education, or big business. After a exploratory field trip out to Hunts Point in the Bronx, the main food hub for all of NYC, students went straight to prototyping to exemplify how their topics fit into the food system and how they could design a positive intervention. 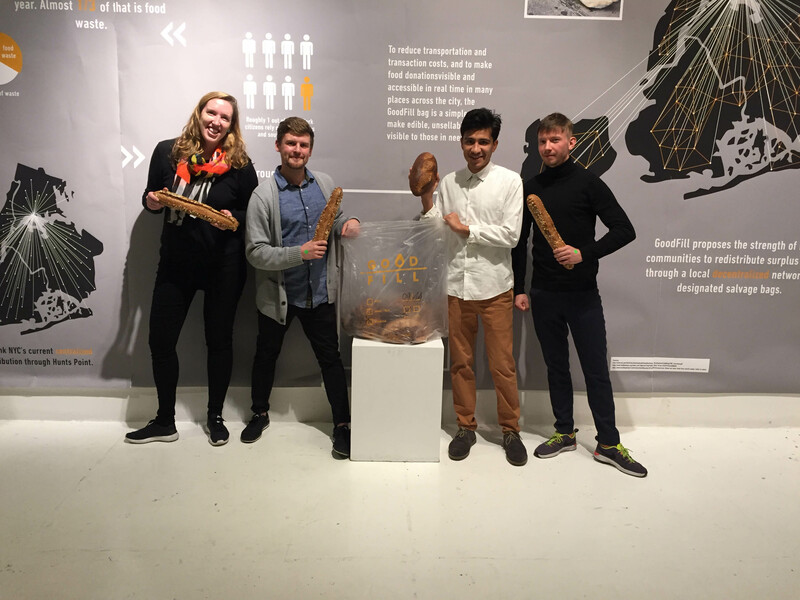 The team of Andrea Burgueño ’16, Cameron Hanson ’16, Christian Smirnow ’17, Christopher Lopez ’17 and Jack Wilkinson ’17 took on the challenge of designing something relating to safety and grassroots organizations, within the context of the food system. Inspired by their visit to the NYC Food Bank and joining a group of freegans in collecting edible food from sidewalk trash bags, they hit on a central question: How might we safely gather discarded-but-still-edible food within New York City? The answer: the GoodFill bag. It’s a transparent bag with distinctive fluorescent writing on it. Groceries and restaurants can use the bag for food that they can no longer sell, but is still edible. They can label each bag with pertinent information about its contents and then leave it on the curb. As is legal in NYC, passersby can easily see and identify food and gather food without a stigma. This project demonstrates that in the vastly large and complex of food systems in NYC, it can be a simple intervention, such as the redesign of the artifact of a so-called trash bag, that can make big impact. 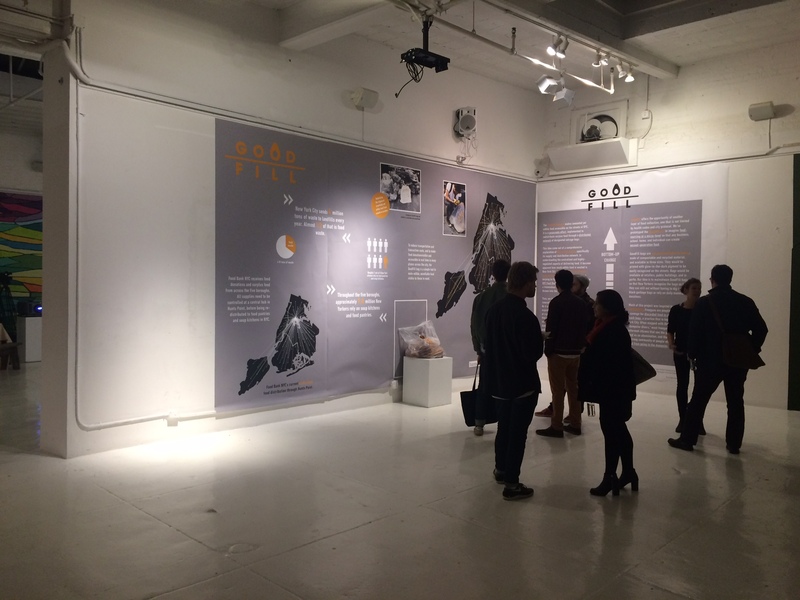 This project was recently exhibited at Social Innovation Week at the Openhouse gallery in Soho, during the week of November 7-13, 2015.